Latest colorway of the Nike Blazer High is now available at Nike Sportswear retailers. Continuing with the unlimited amount of impressive releases this holiday season, Nike Sportswear hits us with yet another impressive make up of the Blazer High Premium. 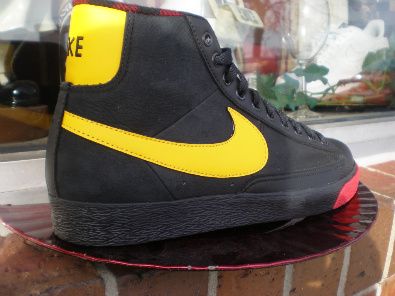 Working with a clean combination of black, del sole and varsity red, this latest Blazer High is perfect for that diehard Pittsburgh Pirates fan. 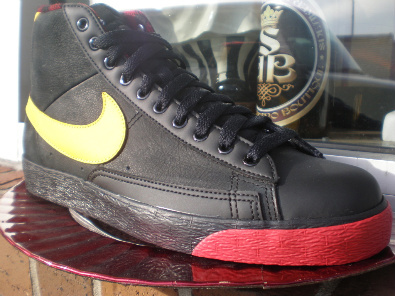 Black leather works most of the upper, along with del sol taking place on the smooth leather Swoosh and back tab. Red is seen working the lumberjack sockliner, and also comes together with black on the vulcanized sole below. Look for this latest colorway of the Nike Blazer High Premium to arrive at Nike Sportswear retailers this month.